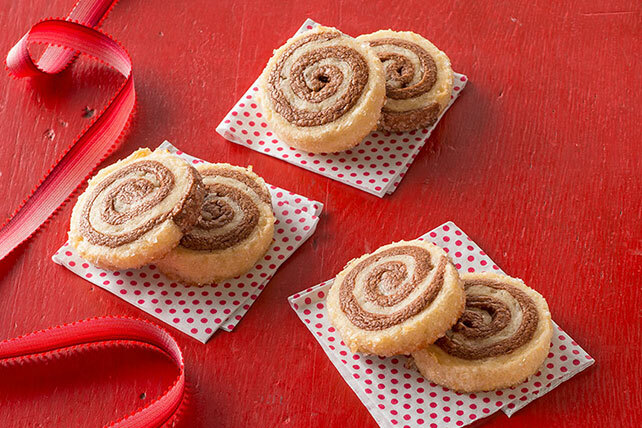 Layers of chocolate and coconut dough rolled in sugar make fancy pinwheel cookies that will impress your family and friends! Combine flour and baking powder. Beat butter and granulated sugar in large bowl with mixer until light and fluffy. Blend in egg and vanilla. Gradually add flour mixture, mixing well after each addition. Divide dough in half. Add coconut to half the dough; mix well. Mix melted chocolate with remaining dough. Wrap separately in plastic wrap. Refrigerate 1 hour. Divide each ball of dough in half. Place 1 piece of dough between 2 sheets of parchment paper; roll into 7-inch square. Return to refrigerator. Repeat with remaining dough. Stack 1 chocolate square on top of 1 coconut square, removing parchment paper sheets between layers. Repeat with remaining dough squares to form second stack. Remove top sheets of parchment paper. Tightly roll up each stack, using bottom sheet of parchment paper to help roll dough. Spread coarse sugar onto additional sheet of parchment paper. Roll each log in sugar until evenly coated. Wrap individually in plastic wrap. Refrigerate 4 hours. Heat oven to 375°F. Unwrap dough; cut each log into 24 slices. Place, 2 inches apart, on baking sheet. Bake 8 to 10 min. or until edges are golden brown. Cool on baking sheets 1 min. Remove to wire racks; cool completely. Balance out your food choices throughout the day so you can enjoy a serving of these cookies. Peel back top sheet of waxed paper on each dough stack. Hold bottom sheet of waxed paper, then flip chocolate dough square over onto coconut dough square. Remove waxed paper, then roll into log as directed. Cut 1 log of dough into 4 pieces; cut each piece in half, then each half into thirds to make 24 slices. Repeat with remaining log of dough.